In the pre-dawn fog, commuters wait outside the Pechersk Metro station in Kyiv, Ukraine, 65 miles from Chernobyl. Radiation from Chernobyl dispersed erratically, based on winds and rainfall. Officially, the radiation leapfrogged over Kyiv and did not affect the capital. However, some Kyiv residents now question whether this is really true. 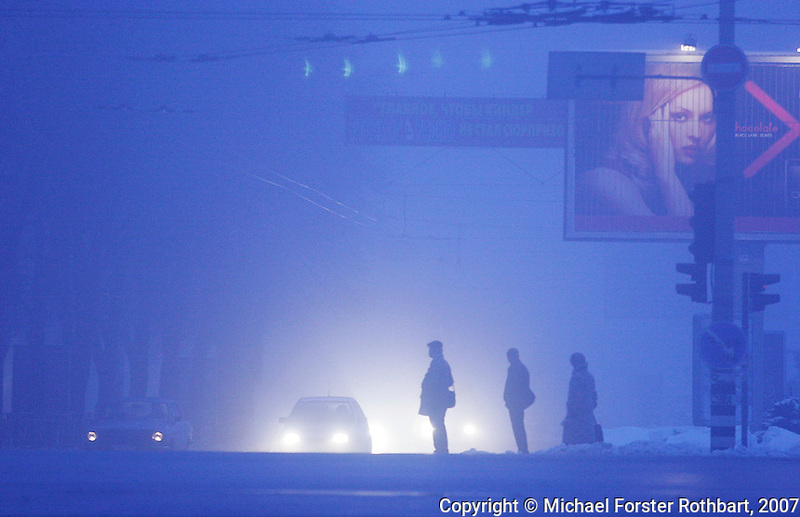 Original caption: .Photo title:.Winter twilight in Pechersk, Kyiv..Caption:.In the pre-dawn fog, commuters wait to cross the street outside the Pechersk Metro station in Kyiv, 65 miles from Chernobyl...Radiation from Chernobyl dispersed erratically, based on winds and rainfall. Officially, the radiation leapfrogged over Kyiv and did not affect the capital. However, many Kyiv residents question whether this is really true. ..Quote: none.-------------------.